Thick 'n creamy with notes of dark chocolate and a warm toasted finish. Complex as boutique whiskey. Our pride and obsession. Our standards for this blend are so high, we literally travel the world every year to make sure the components are exactly as they should be. The roast profile is so ingrained in our roasters' brains, they could draw it with their eyes closed. 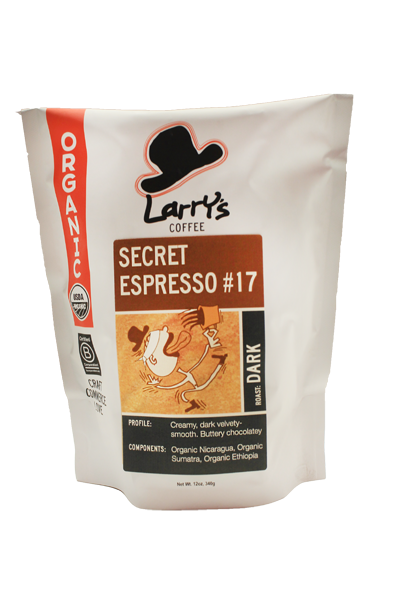 Comprised of coffees from around the world, including some super secret Larry's Coffee exclusives, the shots pulled from this blend are truly a tour de force. Rich, creamy, and brimming with notes of dark chocolate and toasted tobacco. A refreshingly tangy acidity balances with the full-bodied complexity, resolving to a finish that lingers sweetly before drifting away slowly, leaving you wanting another taste.